Caring for a cat or a dog requires much more then merely providing food, water, and shelter. Before adopting a new companion animal, it is important to ask yourself the following questions. Where should I adopt my cat or dog? Please adopt a companion animal from a shelter, where a wide variety of rescued, healthy cats and dogs are waiting to become part of your family. Every year, thousands of cats and dogs are left homeless because of the irresponsibility of their guardians and of breeders. Of the large numbers of cats and dogs brought to shelters each year, many are euthanized after a waiting period of as little as three days to make room for new arrivals. Most of these animals would make wonderful companions but have simply been extremely unlucky. A few phone calls to local shelters will put you on the right track to finding your new companion animal. You can check the telephone directory for animal shelter, animal control, or humane society. Many shelters also have websites with pictures and personal histories of adoptable cats and dogs. Some veterinarians, local papers, and Internet sites may also have listings of animals for adoption in your area. Do not be discouraged if you visit a shelter and there are no dogs or cats appropriate for you. Shelters receive new animals every day. Which animal companion is right for me? Cats can make wonderful companions and easily adjust to a variety of living styles. However, each cat has a unique personality, so it’s important to adopt a cat with traits that work well with your own. Try to spend some time with the cat at the shelter. Remember, these cats are in an unfamiliar environment, so they may temporarily act shy or even frightened. You should also keep in mind the kind of animals you already have at home before adopting another one. Many cats will get along with other cats and also with dogs. Allow some time for adjustment. Dogs are known as man’s best friend for a reason — they make great companions. If you’re an elderly person living alone in a small apartment, a very active dog may not be right for you. This same dog might be a great match for an active family with a large backyard. 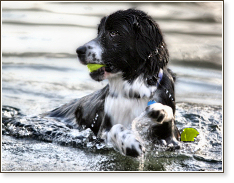 Be sure to consider the dog’s exercise requirements and compatibility with children. If you have children, a very small animal may be too delicate for them to play with. Remember that each animal is an individual with a personality. Visit with them at the shelter, always keeping in mind that an animal’s true personality might not always show in a shelter environment. Whether you want to adopt a cat or dog, there are many advantages to adopting an older animal rather than a puppy or a kitten. It is likely that the cat or dog has been waiting at the shelter a long time, and many aspects of the animal's personality will be known to the staff. You will not have to dedicate the next couple of months to training and disciplining a puppy or kitten. In the case of a dog, the full size will also be known, there will be no need for basic toilet training, and you won't have to cope with shoes chewed by a teething puppy. Can I afford a new cat or dog? Some animals can damage furniture, carpets, and other items, especially puppies who are not yet toilet-trained, or teething puppies. Responsible arrangements must be made when you go away on vacation. If you do not have anyone willing to care for your dog or cat, be sure you can afford a kennel or pet-sitting service. If you live in a house with a yard, you should consider paying for a fence — a secure one — for your dog. There are also fences that are designed to be completely secure for cats. Note: We do not recommend the use of an "invisible fence" — an electric wire buried under the ground, used in conjunction with a shock collar. Although they can cost less than secure conventional fencing, they can cause a dog to suffer from emotional and psychological trauma. Most important are the veterinary bills. In addition to the initial visit to a veterinarian and to routine annual veterinary care, your cat or dog must be neutered or spayed if he or she is not already. Microchipping is the best way to ensure that a lost dog or cat will be reunited with you. In Israel, microchipping is required for all dogs at the time of their first rabies vaccination. Please consider that if your cat or dog has an emergency or a serious illness, the veterinary bill may be expensive, and as for any other member of your family, you are responsible to provide proper care. Can I have a pet where I live? If you live in a rented apartment or house, be sure to check if dogs or cats are permitted. Learn the restrictions before you bring your companion animal home. Also, consider the animal's activity level. Some small dogs are very active and need a great deal of outdoor exercise. On the other hand, some large dogs require little exercise. Are your living arrangements suitable for the animal you have chosen? Am I going to be able to spend time with my new dog or cat? Companionship. All animals need love and attention, especially while they are settling into a new home. Cats and dogs who are consistently left alone can develop behavioral problems. Exercise. Just like people, animals need exercise to stay healthy and happy. Grooming. This can take a considerable amount of time, especially if the cat or dog has long fur. Dogs will need periodic bathing. Basic obedience training. Training can eliminate many problems and prevent others from developing. Is my family situation stable? If you are marrying, divorcing, about to have a new baby, moving, graduating, mourning the death of a family member, dealing with major health problems, then this may not be the right time to take on the added responsibility of a companion animal. Adoption is a lifetime commitment. Since dogs can live up to 17 years and cats to over 20, be prepared to spend almost two decades with your companion animal. Your cat or dog will be a permanent part of your life through many life changes. It is heartbreaking to have to cut that bond for any reason. If you are a student, in the military, or travel frequently as part of your job, you may want to wait until you settle down before you adopt. What do I need to consider when first arriving at home? Adjusting to a new home takes time, so you will need patience. Be sure your new cat or dog has been given a heath check-up and any necessary vaccinations before putting him together with your other animals. Animal-proof your home just as you would child-proof it! Remember to be reasonable with your expectations. An animal companion needs love, and he will return the love in due time. Soon, you won’t be able to imagine life without your cat or dog. Introduce your cat to your dog with a high wire or similar gate between them. Slowly get them accustomed to one another by keeping them separate until they’re curious about one another. Then, under your supervision, allow them to interact for short periods of time. This can take a number of days, but eventually they should become comfortable around one another. Watch their interactions and be extremely vigilant, especially about the food bowl, toys, and when either one is sleeping. Introduce your dog to the new dog by taking both out for a walk together on neutral ground before entering your home. This is a safe, non-threatening environment in which they can get to know each other better. Do not leave toys, bones, or food bowls down as they may become trophies to be won. Never leave the dogs unsupervised until you are completely comfortable that their interactions are friendly. Watch their interactions closely, and be quick to distract or interrupt any aggressive behavior and redirect their attention to another activity. Allow the dogs to establish their social status with each other. Be calm and quiet around the animal until he gets to know you. Don’t disturb an animal while he is eating or sleeping. Don’t pull his ears, tail, or fur. Take care not to step on his legs. Never tease a cat or dog. Once home, never leave very young children and animals unsupervised under any circumstances. Teach your children how to treat cats and dogs while you are teaching the cat or dog how to act with children. Oversee and involve your children in all aspects of the cat or dog's care, sharing responsibilities in fulfilling his needs. In this way, you will be helping your children understand correct and safe behavior. For example, show them how to prepare the cat's food, or how to brush the dog. Similarly, reward your cat or dog with treats and show approval for obedient and relaxed behavior in the presence of the children.